Claiming he survived by catching fish with his bare hands and drinking bird blood, a fisherman from El Salvador says he was adrift in a open boat for more than a year, traveling thousands of miles before reaching the tiny island of Ebon. The man identified himself to U.S authorities as 37-year-old Jose Salvador Alvarenga. His shark-hunting expedition was botched after the ship lost power and a storm swept him and his partner off course. According to the local civil defense office, a tiny fishing boat carrying two men — named Cirilo Vargas and 15-year-old Ezequiel Cordoba — disappeared during bad weather on November 17th, 2012, and no trace of them or the craft was found despite a two-week search. Alvarenga claims to have set sail on December 21st, 2012. Alvarenga said his fellow fisherman, who he identified as Ezequiel, died after about a month at sea after refusing to eat. Alvarenga says he survived by eating raw fish, birds, bird blood, barnacles, and turtles. His boat eventually washed ashore on the remote Marshall Islands atoll of Ebon, about 6,200 miles across the Pacific Ocean from the fishing hamlet of Costa Azul, Mexico, where he set out. 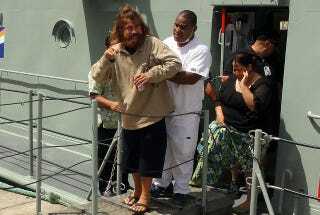 Alvarenga did not appear badly sunburned, despite his account of spending such a long time adrift. "It's hard for me to imagine someone surviving 13 months at sea," said U.S. Ambassador Tom Armbruster in Majuro, capital of the Marshall Islands, after speaking with Alvarenga. "But it's also hard to imagine how someone might arrive on Ebon out of the blue. Certainly this guy has had an ordeal, and has been at sea for some time." Armbruster said the soft-spoken man complained of joint pain Monday and had a limp, but could walk. He had long hair and a beard, and rather than appearing emaciated he looked puffy in places, including around his ankles, said the ambassador. Otherwise, he added, Alvarenga seemed in reasonable health. Strange story, but much of his account adds up. The boat, for example, is in bad shape and covered in algae. It also features a small blue container that he used to shelter himself from the sun. What's more, experts say his trajectory would in fact take him towards the Marshall Islands where he was eventually found.